In macOS Mojave's second beta, a few things have changed for the better including enhancements to the new system-wide Dark Mode and better optimization for smaller screens. Arriving two weeks after the initial developer seed, macOS 10.14 is overall a fairly minor update as far as betas go. Support for the 2010 Mac Pro is still missing, and is coming in a future pre-release update. Additionally, the Mac App Store now has a more flexible size, able to be much more narrow to fit into smaller screens better. 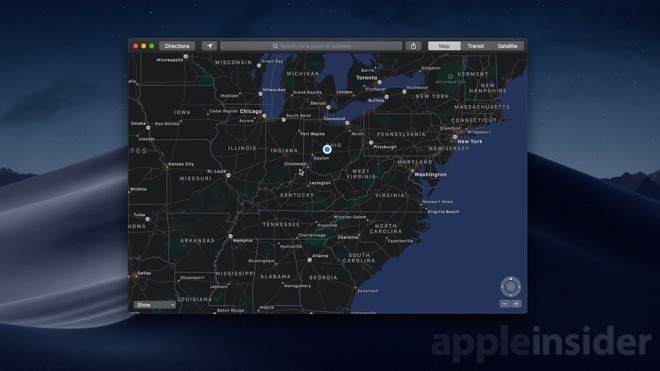 Maps also saw some Dark Mode tweaks, now using the nighttime version of the map when browsing with the darker interface. Of course, a whole host of bugs were also squashed in this update. Still missing, however, is the dynamic background that will lighten and darken throughout the day. Pro tip: Learn how to quickly jump between light and dark modes with the press of a keystroke. macOS Mojave will be shipping this fall alongside iOS 12, tvOS 12, and watchOS 5. If you haven't already, check out what is new in beta two of iOS, watchOS, and tvOS. And to get the lowest price on a Mojave-ready Mac, be sure to check out our Price Guides, which are updated daily, as well as our exclusive deals on 2016 15-inch MacBook Pros.